These are just a few sites that we thought might be helpful to you in your search for information. A public resource on clinical lab testing, this site offers explanations of blood tests. If you click on the Australian flag icon (top of the menu) – the information will be presented in a way that is specific for the Australasian healthcare setting (e.g., laboratory tests results (the numbers and units) are presented differently in the USA as compared to Australia/NZ). Follow the above link to read more about the tests they perform. Provides information about lab testing within New Zealand. Please note that by Sept 2009, lab testing in Auckland will be carried out by Labtests. Written by physicians, this is the largest web site devoted to endocrine disorders, including disorders of the thyroid. Excellent links and very thorough descriptions. E-medicine has an extensive endocrinology section. This site provides excellent information with articles written by clinicians and scientists. The content in e-medicine can be quite technical but the articles are very thorough. A service dedicated to educating the public about endocrine disorders. There is a patient section with explanations and fact sheets. This site is sponsored by the Endocrine Society, a professional organisation comprised of international experts (research and medical) on endocrine disorders. 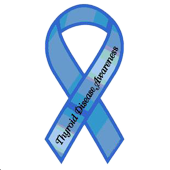 The goal of this site is to assist physicians in managing patients who have thyroid disease. This site has been created and maintained by members who have thyroid disorders. In addition to a community chat folder, it has separate folders for chatting about Hashimoto's/hypothyroidism, Graves'/hyperthyroidism, co-morbid conditions, nutrition & supplements and self-improvement, as well as regularly updated links to research reports, articles and news items of interest. Sponsored by the National Library of Medicine (USA), this site offers a reliable source of information and is intended for a general audience. A good source of information, but please take note that several pages state authors' personal opinions only. This site also has videos that to explain the basics of thyroid conditions and how they are treated. The videos require no special set up – all you do is click ‘play’, watch and listen. Well worth a look. A support organisation for people affected by thyroid conditions. A section titled “Starters” – contains a comprehensive list of various thyroid conditions, as well as reliable links. Membership is required to access their newsletters. This site contains educational material that is concise and easy to understand. A very helpful site if you’re looking for more background information. If you would like more information about how to find reliable information on the internet, go to Health On the Net Foundation, which will tell you more about how to seek out reliable health-related websites.